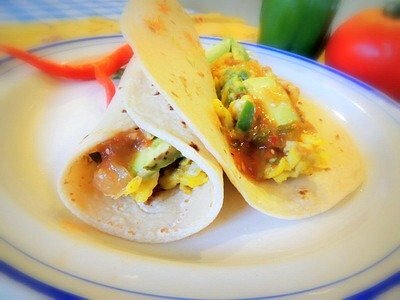 This is a breakfast burrito recipe that's low glycemic and as light as a breakfast burrito can be and still taste fantastic! This is how you have your cake and eat it too. Eat like a King in the morning for breakfast, like a Queen at lunch time and a pauper at night. Plan to eat your heaviest meals in the morning and at lunch time so you will burn off these calories during the day. Eat no carbohydrate dense foods at night - only fresh fruits and vegetables and some protein after 5:00 p.m. Here it is ... a breakfast burrito for a king! Preheat your oven to 375 degrees, slice the avocado and take out your salsa. There are so many great brands of fresh salsa in the refrigerator section of the grocery store, there's no need to make your own. Heat the oil in a frying pan while you are chopping the onions, pepper and cilantro. Sauté the onions and green pepper in the oil over medium heat for 5 minutes. While the onions are cooking beat the eggs with the salt and pepper. Put the tortillas in the oven directly on the shelf to get warm and set a timer for 5 minutes. Add the eggs to the pan and stir with a wooden spoon until the eggs are cooked through. The secret to perfect scrambled eggs is tending to them carefully over medium heat with constant stirring with a wooden spoon. You need to stop the minute they are done but still moist. By this time your tortillas are ready. Now you are ready to assemble the burritos. Take the tortillas out and put them on your plate. Spoon the egg mixture onto each tortilla, top with salsa , 1 slice of avocado and a half the cilantro. Spread it out but leave room at the ends, roll it up and enjoy! It's messy but super delicious. This is a very filling breakfast (or lunch) and goes well with a few fresh orange quarters. Unlike most of the super heavy, carbohydrate rich breakfast burrito recipes you see, this one is light, yet rich enough, spicy and filling. There are many other low glycemic recipes to choose from for your breakfast but a healthy, breakfast burrito recipe is a great choice. It combines some protein, low glycemic carbs and good fats with lots of good fiber. Use wholewheat tortillas or better yet sprouted grain tortillas. Alvarado Street Bakery or Ezekiel make sprouted grain tortillas. Or if you can find the very flavorful Mi Rancho tortillas they make a whole grain blend of wheat and corn masa. If you only eat one breakfast burrito because the tortilla is large, you could add some fresh fruit with a doll0p of yogurt. Either way with tea or a cup of coffee you have a yummy start to your day and you will have good energy all morning. If you eat two even though they are light as burritos go they are a carbohydrate dense breakfast so be sure to eat lightly for lunch and dinner. There are lots of variations to this. You could add diced garlic to the onions, a little grated zucchini, chopped tomatoes and some cumin powder. You could sprinkle some grated cheese on the eggs before they are set. If you are insulin resistant or type 2 diabetes you probably should stick to the sprouted grain tortillas only, to make sure you are not setting yourself up for craving more carbs. This breakfast burrito recipe is one of our printable low glycemic index recipes. Return from Breakfast Burrito Recipe to Low Glycemic Recipes. Return from Breakfast Burrito Recipe to Lifetime Fat Loss home page.